The way this works is, visitors to my Facebook page who are not yet a fan first land here and are encouraged to become a fan, then after they are a fan, then they are encouraged to share my Facebook page with their friends. They simply select their friends and send them an invite. for your invite tab on your Facebook page. give it your own filename (no spaces). but the Facebook code above. From this point forward are the instructions for implementing this into your own Facebook page. First, you must be logged into your Facebook profile. Enter the captcha verification words. Make sure you have the “app name” in the Basic Info section. Under “Contact Info” put your email address in the “Contact email” and “User support email”. invite tab work and to integrate your invite tab into Facebook. “App Info” – this will be pre-populated for you, nothing to do here. ‘Canvas Page’ – this refers to the Facebook page that is the actual home for your Facebook app. It looks a lot like a Facebook Fan Page, but you only need it to get to your actual invite app. 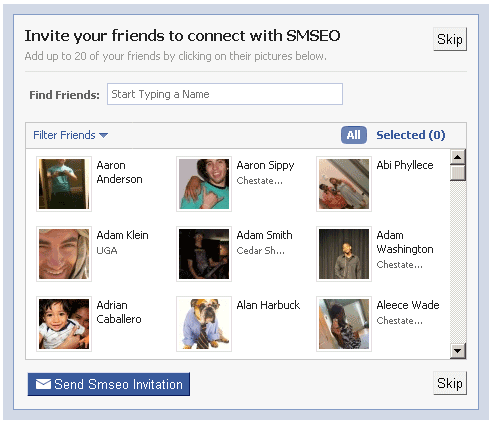 So give it a name that you’ll remember – I named mine “smseoinvite” because SMSEO refers to my Facebook page and invite refers to what my app does. So now just put the name (without spaces) in the box provided. ‘Canvas URL’ – this is the base URL of the site where Facebook app file will be be hosted. All Facebook apps must be uploaded to a server (to your own host). I have all of my Facebook apps hosted on the same server where I host my blog (socialmediaseo.net), so the ‘Canvas URL’ that I enter in this spot is “http:socialmediaseo.net” (without quotes). Likewise, you’ll do the same and you’ll upload your app file to the root directory of this base URL (or canvas url). ‘Secure Canvas URL’ – don’t worry about this field, nothing to do here. The code at the top of this file makes this file you are reading sufficient for the file. Just resave this file and name it your desired file name. Remove all of the text below the Facebook code (that’s basically all of these instructions), but don’t worry because you resaved a file and named is something different, remember? So you have the original file with all of these instructions. will see as text on your app. what about the fact that FBML will soon be gone? Is there a way to create without FBML? Actually you are correct – after writing this I did some more research and discovered that you can no longer create apps with an FBML option. Initially Facebook removed the FBML app, and then came the update that removed the FBML option from current app development platform. So basically there is no longer an FBML integration option anywhere on Facebook.